Use the Logitech Harmony Remote Software to add devices and setup your remote. Once set up, continue to use this software to make configuration changes in the future. Harmony software allows you to set up your new Harmony remote or make configuration changes and customization to your existing remote. 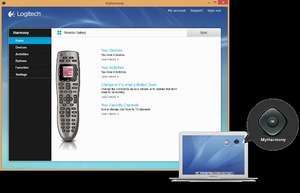 For security reasons, you should also check out the Logitech Harmony Remote Software download at LO4D.com which includes virus and malware tests. Additional screenshots of this application download may be available, too.